Diet It Up: Chocolate for breakfast? Yes you can! I haven’t had a whole lot of time to cook this week, but I always make time to eat! 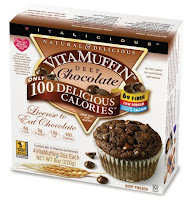 I bought a box of these VitaMuffins at the supermarket last week because the self checkout machine so nicely spit out a $2 off coupon for me. Even the cash register is encouraging me to eat healthy! I know these have been on the market for a while, but they’re a little pricey and I didn’t think they’d be good enough to splurge for $5 a box. But on sale, I’d give them a try. My first reaction was, “this is the tiniest muffin I’ve ever seen.” They are definitely small. I didn’t count on them to be enough to eat for breakfast, so I scrambled up some egg beaters in the morning and tried the muffin as a morning snack a few hours later. As instructed, I unwrapped the plastic and let the microwave do its work for 20 seconds. I took the first bite expecting a rubbery, artificial taste. I was completely surprised. They’re very moist and the few chocolate chips sprinkled on top get all melty when you heat them up. The muffin was very chocolaty and not in a “chocolate-like flavoring” way. This tasted like a legit muffin! I couldn’t believe it! So, I flipped over the box expecting the caloric info to be terrible. Some of these products marketed as “healthy” are complete imposters. Never trust the fancy packaging. Graphic designers are paid big bucks to fool us into thinking a standard chocolate muffin is good for you. But, I was surprised yet again. They’re only 100 calories, 1.5 grams of fat (no trans fat) and 9 grams of sugar. To top it off, they bring 6 grams of fiber, 3 grams of protein and 15 added vitamins and minerals to the party. In that little muffin? That’s crazy talk. These must be made entirely of chemicals. Wrong again. The first four ingredients are Water, whole wheat flour, organic sugar and egg whites. Go out and buy a box, they’re perfect if you need a sweet start to your morning and I was surprisingly full for a few hours after just a few bites.